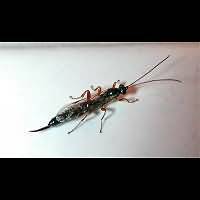 Clistopyga incitator is a Parasitic Wasp measuring anything from 5 to 11 mm. 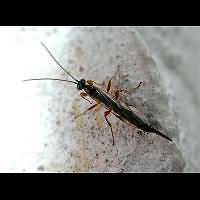 Like the other members of this genus, females have a short ovipositor, usually 3 mm or less. The end is slightly pointing upwards. The abdomen is black or black with brownish red. The only look-a-like is Clistopyga rufator. That species however has many more red segments in the abdomen and the red is really red and not brownish (red). Perithous species also look like Clistopyga incitator, but their ovipositor is much longer. 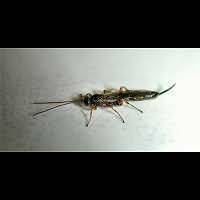 The animal in our pictures has a short ovipositor and is entirely black, so it can only be Clistopyga incitator. This wasp is known to use various hosts. It is well known for using the Snake Back Spider. But it is also interested in the larvae and pupae of some beetles, like the Powderpost Beetle and the Fan-bearing Wood-borer. But the larvae and pupae of some species of moths should also fear its presence, such as the Willow Ermine, the Apple Ermine and the Pine Shoot Moth. It is less well known how this wasp operates, alas. Adult wasps are seen from the end of April to the middle of October. It probably is a common species, even though it is rarely seen. It inhabits all of Europe (including Madeira) and Northern Africa (including the Canary Islands). This page has last been modified on Monday, October 29, 2018.